Adelante – Series II, 2016, video stills. I construct and reflect upon my patient narratives as an artist and carrier of the CDH1 genetic mutation, associated primarily with Hereditary Diffuse Gastric Cancer. Art practice is proposed as a means of documenting, articulating, and analysing patient experience of genetic diagnosis and preventative surgery. Art is employed to examine the relation between genetic diagnosis and patient narrative, with attention to the CDH1 genetic mutation. The discourse and structure of patient narrative are considered, questioning whether current definitions accommodate the complex relation between genetic diagnosis and patient narrative. As contemporary medical practice is increasingly informed by genetic research, renewed stress is placed on patients to articulate their experiences, suggesting that patient experiences are neither wholly captured nor predicted by diagnostic data. My thesis—Re-imagining Patient Narrative: Exploring Patient Experience of Genetic Medicine through Art Practice—is the timely examination of patient narrative. The potential of art practice to voice patient experience of genetic medicine is proposed as a vital contribution to knowledge. I trace the historical emergence of patient narrative (the means by which a self-identifying patient or family member records and articulates personal experience of illness), examining prominent ideas in the current field of patient narrative: biographical disruption, narrative reconstruction, and the sociologist Arthur Frank’s typologies of illness narrative. I explore Frank’s Quest Narrative —his ideal illness narrative—adopting elements for my quest, led by art practice, to locate my stomach. Contextualising my work in this field, I construct new ways to explore my patient experience through a responsive, fluid art practice, challenging existing models that fail to reveal what it means to be a patient of genetic medicine. Informed by my experience, auto-ethnography—deriving from a range of disciplines as a move to more empathetic representational forms that take into account lived experience—is both a research methodology and outcome. The work of others provides a framework for my practical experimentation, simultaneously enhancing my understanding of different approaches to narrative, discovering areas to explore through production, and providing models for addressing patient narrative in a meaningful way. Recognising the experimental potential of narrative formation, I work with movement, rhythm, reflection, opacity, focus, emplotment, sequence, editing, fragment, sound, staging, framing, light, and documentation. I explore different narrative forms, including sonic, haptic, performed, embodied, book, digital; and singular, dialogic, and multiple narratives. 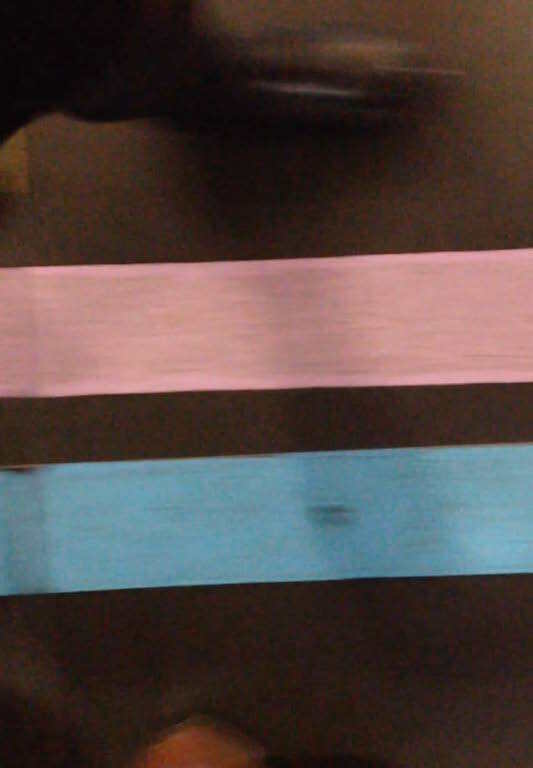 Adelante – Series II is a 22-second video work; a ticket management system (paper ticket machine, radio-controlled LCD number display, and waiting chairs); and a series of blue, green, yellow, orange, and red coloured lines (50mm wide), taped onto the institution floor. The video in Adelante – Series II was filmed on my mobile phone in a hospital in Porto. I visited the hospital in Spring 2016 for an appointment with an influential pathologist who specialises in hereditary diffuse gastric cancer. I was on a quest to locate my stomach and this meeting was no doubt going to be the highlight. I arrived at the hospital early; my schedule was sparse and I was afraid of being late. Once I had located our meeting point, I went outside to kill time. I perched on a concrete block at the beginning of the concourse, which led into the hospital. An elderly man was perched nearby. He seemed to be waiting for someone. I imagined that he had just been discharged and I was worried that this someone wouldn’t appear. We smiled at each other. After some time, I found the courage to try and speak with him. I hate not having a command of Portuguese. I understood that he was waiting for his wife to collect him. I offered him some of my banana and some of my coke. I studied the people coming and going to and from the hospital. I studied their faces, their expressions, the movements they made, this rhythm, and pace. I thought I knew those entering to be admitted from those who had just been released. I recognised something about the way they were looking at the world – their eyes taking in everything, elated and free, or resigned and often steadied by the arm of someone accompanying them. Eventually the time came for me to go inside. 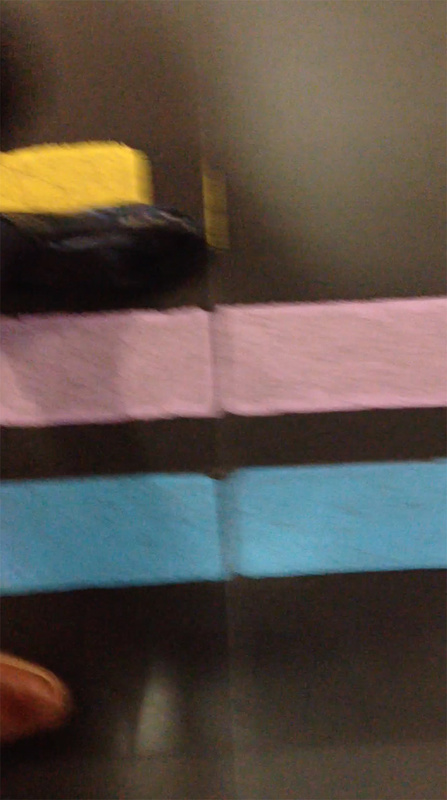 On my way out, I noticed the coloured lines taped on the floor. I had seen similar lines before in hospitals in the UK. 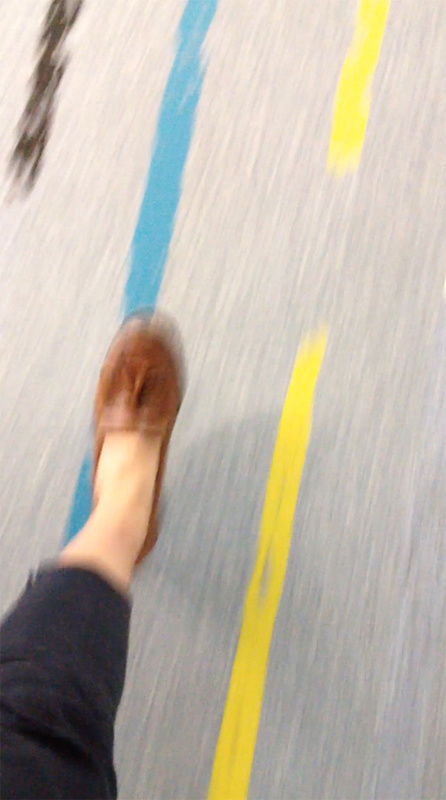 There I had covertly filmed myself walking along on the lines on my mobile phone. The lines in Porto were not in the atrium waiting area, but beyond the turnstiles and a few security officials that separated the two areas. I was accompanied out with a pathology student. He was interested in art and design; he told me that lived with a designer. He had given the pathologist a thesis of his to read with the caveat that she couldn’t write comments directly on it as he had used really nice paper. I thought he was very funny. He showed me his thesis. On the first page was a quote from Alice in Wonderland. 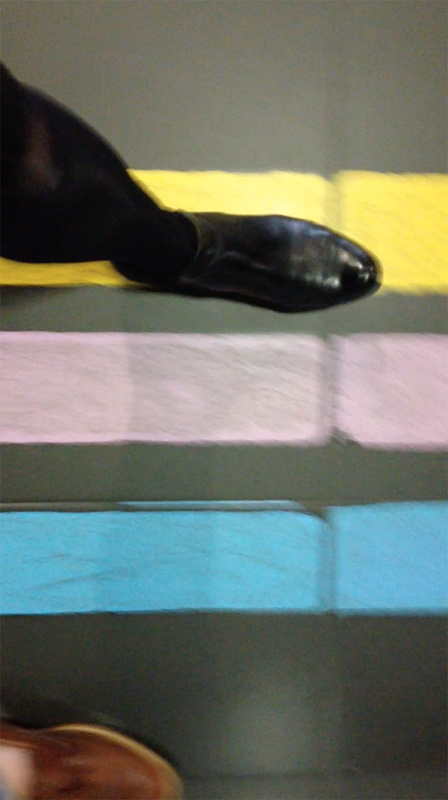 We walked by the lines together and I told him how I liked them. He said he thought a fine artist had designed them. I asked if it would be ok to film them on my phone. 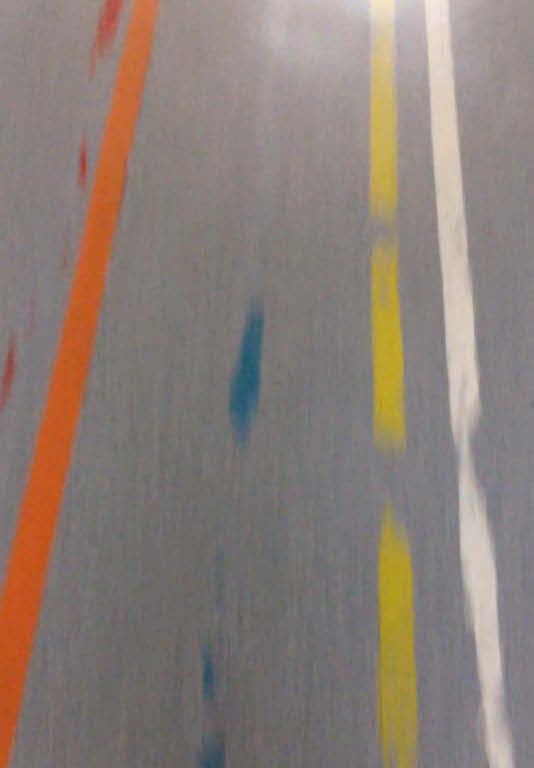 We walked along the lines together and I filmed this on my phone. We said goodbye, I went through the turnstile, back out along the concourse; passing the concrete block, I was happy to see that the man had left also. 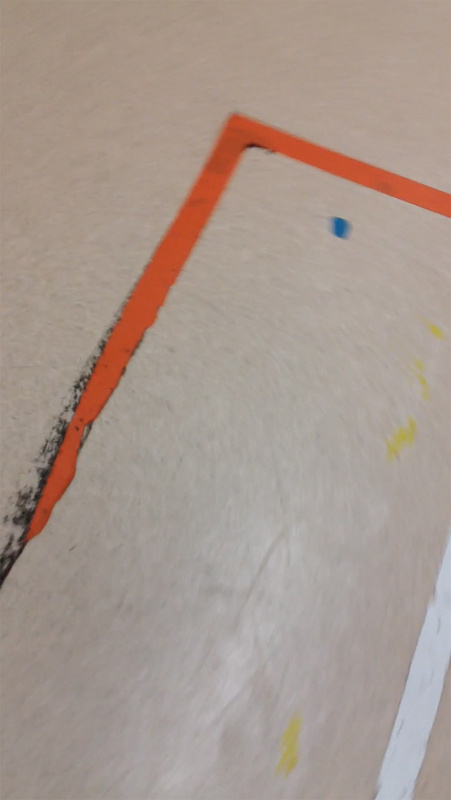 Now, I wonder about the lines on the floor. No one has ever mentioned them to me and they have never rescued me and I am often lost in the hospital. And the randomness of the ticket machine; I’ve never been told to take a ticket, I just figure—there is a LCD display, and people are waiting. They catch my attention because they don’t make sense; I am already disorientated in time and in space. They are institutional yet they don’t seem to comply. There is no common sense yet I really enjoy them. I’m not sure if their form reassures me; I don’t think they orientate me—they are nearly always broken and peeling away anyway, like the aeroplane window fixed with gaffa tape. Like an arbitrary shape for orientation applied to a narrative to make it make sense, mapping and hiding chaos. What makes us walk? My camera captures the detail. I pause and examine the image. A step into the future. Time. I play it backwards and it plays backwards. It is almost nothing, but it is the compelling beginning of a journey. I read it’s the first step that counts. Momentum. Emma Frances O’Connor is an artist; a third year AHRC funded Ph.D. student in the Department of Art and Design, Sheffield Hallam University; and a teacher at Sheffield University, English Language Teaching Centre. Her Ph.D. title is Re-imagining Patient Narrative: Exploring Patient Experience of Genetic Medicine through Art Practice. O’Connor constructs and reflects upon her patient narratives as an artist and carrier of the CDH1 genetic mutation, associated primarily with Hereditary Diffuse Gastric Cancer. Art practice is proposed as a means of documenting, articulating, and analysing patient experience of genetic diagnosis and preventative surgery. O’Connor employs art to examine the relation between genetic diagnosis and patient narrative, with attention to the CDH1 genetic mutation. The discourse and structure of patient narrative are considered, questioning whether current definitions accommodate the complex relation between genetic diagnosis and patient narrative.